Artwork of a Gold Medal. This article is about the collectible in Yoshi Topsy-Turvy. 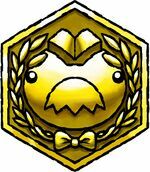 For the item with the same name in Super Paper Mario, see Gold Medal (Super Paper Mario). A Gold Medal (also known as a Gold Happiness Medal) is a collectible in Yoshi Topsy-Turvy. A Gold Medal is earned if Yoshi earns a higher score than the one required by the Spirits. For example, collecting a much higher number of Coins than the target set by the Spirit of Greed will earn Yoshi a Gold Medal. Additionally, collecting a Gold Medal gives the player better odds at winning the Bonus Chance!. Winning a Gold Medal in all levels will unlock the Bonus Game Shuffle Mode EX, which is accessible from the game's main menu. This page was last edited on October 9, 2017, at 22:53.